And they said they would build me a home ! 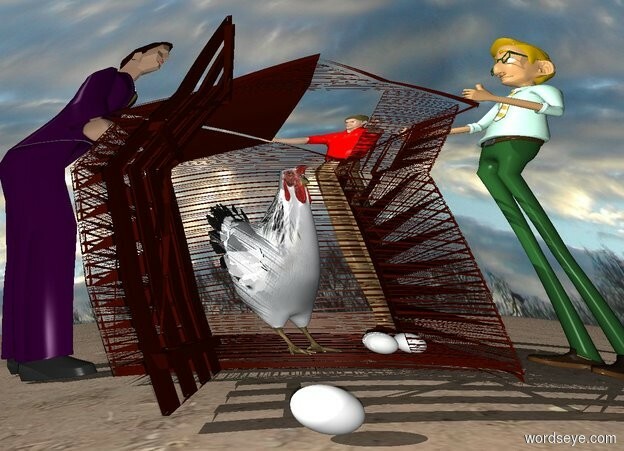 Input text: a device.a shed is 2 feet in front of the device.the shed is facing the device.a 1st man is -6 inches in front of the shed.the 1st man is facing northwest.a chicken is -3 feet behind the shed.the chicken is facing northeast.the 1st man is -30 inches right of the shed.the chicken is 2 inches above the ground.the 1st man's shirt is red.the sky is cloud.the ground is dirt.a 1st egg is right of the chicken.a 2nd egg is behind the 1st egg.the 2nd egg is left of the 1st egg.a 3rd egg is behind the shed.a 2nd man is left of the shed.the 2nd man is facing the shed.the 2nd man's suit is purple.a 3rd man is right of the shed.the 3rd man is facing the shed. lol - they're trying, they're just not very good at it!